Dance Around the World is a multicultural world dance curriculum which builds knowledge and understanding of dance styles from all over the globe and guides students through a process in which they create, apply, reflect, evaluate, and engage. Program includes an optional hip-hop component as well as cultural dance styles from more than 20 different countries. DIGITAL EXPERIENCE: For classrooms around the globe, we present EduMotion: SEL Journeys, a multicultural Social Emotional Learning program delivered digitally to schools anywhere. 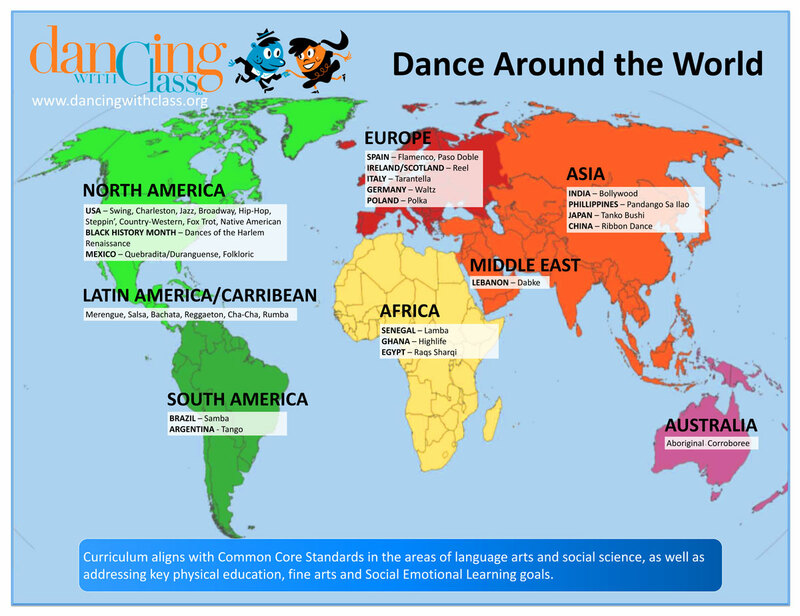 In an after-school format (typically 10-12 weeks), students will learn a dance from each continent. For older students, the class becomes an “Urban Social Dance” experience, fusing several styles of dance in a fun and enlightening way. Each Fall, we offer a variation on Dance Around the World, which incorporates selections from the second act of “The Nutcracker” that represent the cultures of Spain, Russia, China, Poland, and the Middle East (Arabian Peninsula). This program is perfect to culminate in a pre-holiday assembly! Contact us for more information about our Dance Around the World program. Read moreCan Dance Promote World Peace? Read moreSurprise – you’re performing in front of your entire school!